Allergy Advice: Contains Fish (Gouramy). 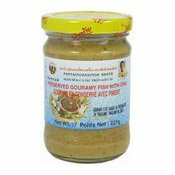 Ingredients: Pickled Gouramy Fish (Gouramy Fish, Fish Sauce, Salt, Rice Powder) (49%), Lemon Juice, Lemongrass, Chilli, Onion, Galangal, Ginger, Kaffir Lime Leaf, Flavour Enhancer (E621), Acidity Regulator (E330). Simply enter your details below and we will send you an e-mail when “Preserved Gouramy Fish With Chilli (辣味發酵魚露)” is back in stock!